Zachary Wadsworth - The Far West | Lawrence Wiliford | Dispeker Artists, Inc. The AIDS epidemic of the late 1980s cut a wide swath through the arts community. It prompted the creation of many works in response, most of which -- to my ears -- remain music of its time. The text for "The Far West" comes from the poetry of Tim Dlugos, written while he was dying of AIDS-related complications in 1990. 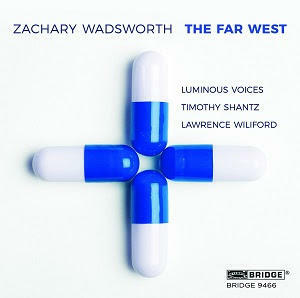 Zachary Wadsworth set the poems to music in 2014. The resulting cantata, The Far West, effectively channels the raw emotions of Dlugos. And I think part of that effectiveness is the distance of time. Wadsworth's setting, being removed from the immediacy of the events, makes the poems more universal. These are feelings that anyone with a debilitating illness, such as cancer, Alzheimer's -- or even just aging -- can relate to (I know I did). Wadsworth effectively uses his forces to plumb the depths of Dlugos' poetry. Tenor Lawrence Wiliford gives voice to the poet, while the Luminous Voices serves as a Greek chorus, commenting on the action. The string ensemble provides the harmonic underpinning and subtly colors the emotions expressed by the text. Wilford sings in a clean, controlled fashion that's expressive without being overly so. That restraint adds a poignancy to the text that I found particularly effective. As Wadsworth explains, the work "contains echoes of Bach's cantatas," and shares some structural similarities in the alternation of soloist and chorus. It's also a work with a purpose. The poems move from despair through acceptance to hope. This is the type of work that yields additional insights with repeated listening. If you purchase this digitally, be sure to get all the movements of this work and listen to them in order. It does make a difference.